We’re back in London! Thank goodness we got most of the touristy site seeing out of the way 3 weeks prior, this time we can at least slow things down a bit. So here it is, our London at-a-glance! The guard change at Buckingham Palace starts promptly at 11:30am. However, come no later than 11:15am as the guards start arriving with music. In the summer, prepare to arrive earlier to beat the crowd. The ceremony is short, 30 minutes from start to finish. And as touristy as it is, it’s still very exciting to watch as onlookers hope to get a glimpse of something more than just the changing of the guards. 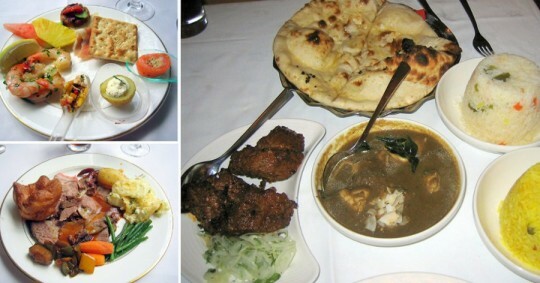 Outrageously amazing Indian food but where else, London. In London, ethnic food is plenty and there is no shortage of great Indian eats. Here’s one and conveniently located within walking distance to our hotel. Although, they should have warned us the spice level would be exponentially hotter than what we’re used to. Halfway through, we ask for extra yoghurt to cool our palettes before finishing our dinner. It’s a good kind of hot. Just be prepared. Consider this your warning. You’re not alone if you can’t afford to shop here. But Harrod’s is still a must visit, if not to shop then worth at least a peruse because it’s like no other department store you’ve ever seen. Sure there’s apparel and luxury accessories. And then children’s, shoes, beauty, sports. Then there’s food and wine and restaurants and champagne bars. The list goes on and on. Since we couldn’t afford to shop, we decided we still could at least brunch like the rich and famous at Georgian Restaurant. 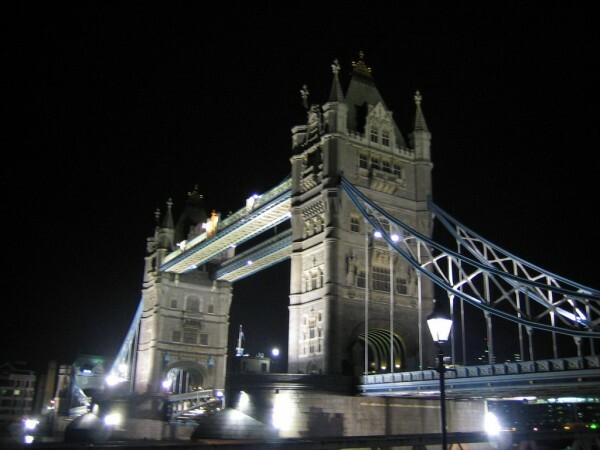 In London, where hotel rooms under $250 a night are scarce to none, imagine our surprised when we came across The Tower on Expedia for $150 a night. At $150 a night, we weren’t expecting much; just better than our hostel the first time around. Color us confused when we walked up to a 4 star hotel overlooking the London Bridge! I kept turning to G mumbling, “This can’t be our hotel,” the entire time we were in line to check in. People were dressed in suits! 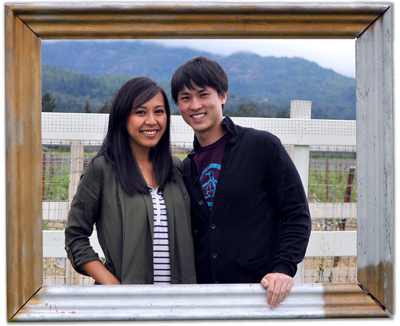 I was pretty embarrass when we walked up with our crummy clothes and filthy backpacks. As out of place as we felt, when we got to the front, the front desk lady assured us we were in the right place. Jackpot! And while we respectfully declined the $50 room upgrade, we got one anyway! 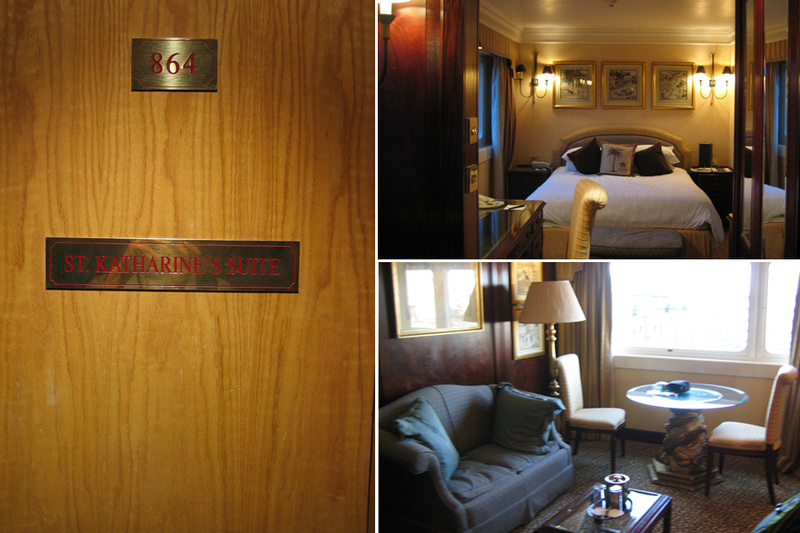 Whether it was out of courtesy or technical error, we weren’t complaining about the upgrade — St. Katherine’s Suite! She probably felt sorry for us. Lol. I’ll take a pity party any day if it means a free upgrade! Share your London highlights in the comments!